The Secret Service, FBI, NSA, CERT (Computer Emergency Response Team) and George Washington University have all identified “Insider Threats as one of the most significant challenges facing IT, security, law enforcement, and intelligence professionals today. This book will teach IT professional and law enforcement officials about the dangers posed by insiders to their IT infrastructure and how to mitigate these risks by designing and implementing secure IT systems as well as security and human resource policies. The book will begin by identifying the types of insiders who are most likely to pose a threat. 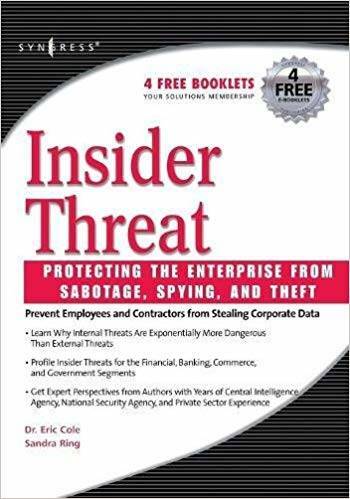 Next, the reader will learn about the variety of tools and attacks used by insiders to commit their crimes including: encryption, steganography, and social engineering. The book will then specifically address the dangers faced by corporations and government agencies. Finally, the reader will learn how to design effective security systems to prevent insider attacks and how to investigate insider security breeches that do occur.